WICHITA, Kan. — BP Wind Energy certainly was getting its money’s worth recently as a steady 30-mile-an-hour wind spun the 148-foot-long turbine blades at the Flat Ridge 1 wind farm at a surprisingly fast clip. The 100-megawatt wind farm north of Medicine Lodge, Kan., has spawned a now-under-construction extension, Flat Ridge 2, that is four times bigger. It’s a key reason why Kansas is the nation’s top destination for wind farm construction this year, with a near-doubling of the state’s power generating capacity to more than 2,600 megawatts. But any prospects for a Flat Ridge 3 look pretty dim right now, as Congress appears unwilling to renew a federal wind power tax credit that expires Dec. 31. An industry executive said plainly that losing the subsidy will kill almost all new construction because it makes the power too expensive. One wind energy manufacturer in Colorado is promising large layoffs if the subsidy isn’t renewed. Wind farms built before the end of the year are unaffected and will continue to receive the tax break. Wind power has proven a contentious issue in Maine. Proponents tout clean energy and work for construction companies, while opponents question the feasibility of the economics, and decry spoiled vistas. 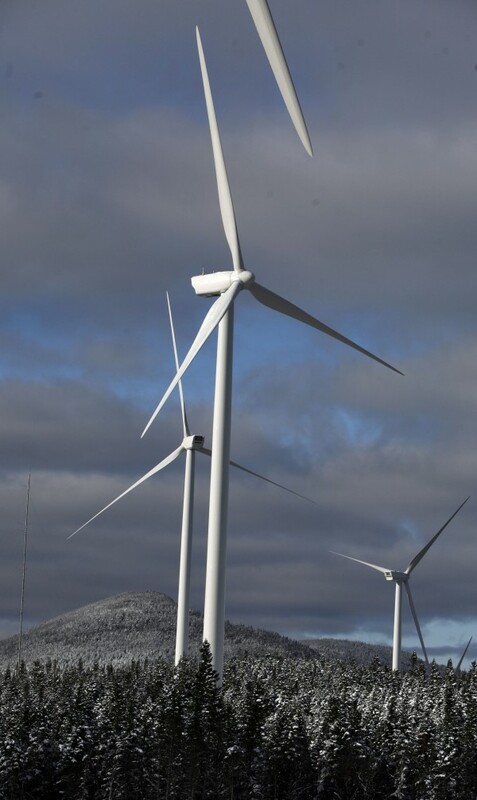 As recently as last week, a 14-turbine industrial wind site called Passadumkeag Wind Park was proposed for Passadumkeag Mountain in Grand Falls Township. Elsewhere, if Congress doesn’t renew the wind power tax credit, it will be a big potential blow to Kansas Gov. Sam Brownback’s vision for a vibrant state wind industry, in the form of the new wind farms and manufacturers such as the Siemens plant in Hutchinson, Kan. A lot of time and money has been spent preparing the state for rapid growth. There’s a lot at stake for Kansas, said state Secretary of Commerce Pat George. And, he said, it’s inevitable that wind power is going to be needed, eventually. The Production Tax Credit was most recently approved in 2009 as part of President Barack Obama’s stimulus effort, although it has largely been in effect since 1992. It provides 2.2 cents per kilowatt hour for utility-scale wind power producers. With the subsidy, said John Graham, CEO of BP Wind Energy, wind-generated electricity is competitive with the least expensive common alternatives. The cost of wind generation has fallen significantly as wind turbines and wind farms have gotten bigger, manufacturing moves from Europe to the U.S. and the technology improves. The cost is close to being competitive, but it is still a few years away, he said. The tax credit, Graham said, costs the government $3.5 billion a year and attracts $15 billion to $20 billion in investment. Sixty percent of wind energy components are now made in the U.S. “We think it’s a very good return,” he said. Apparently so does the rest of the industry. It has launched into a frenzy of production that Matt Kaplan, of IHS Emerging Energy Research in Cambridge, Mass., estimates will add 12 gigawatts of generating capacity, about 20 percent more than the previous peak year. If the tax credit isn’t renewed for 2013? Kaplan estimates construction of 1.5 to 2 gigawatts — about an 85 percent decline. It’s happened before. When Congress failed to renew the tax credit in 1999, 2001 and 2003, new construction plummeted between 73 and 93 percent the following year. “The industry is at the edge of a cliff right now,” Kaplan said. Graham said there might be a few instances where wind farms would make sense without the tax credit. Although wind prices have come down, the shale gas drilling boom has dropped the price of gas below $2.50 per thousand cubic feet. Coal is also a natural low-cost competitor, Kaplan said, but there are enough environmental regulations to slow the opening of new plants. “If gas were to return to $6 or $8 per thousand cubic feet, wind would be competitive,” he said. The disappearance of the tax credit would be a serious blow to the industry, Kaplan said. Even if market conditions change in five years, and the price of natural gas rises in the U.S., the industry couldn’t afford to let its plants and infrastructure sit idle waiting for the market. There is still growth overseas, particularly in China, he said, so the big companies won’t disappear, but their U.S. capacity will suffer. Denmark-based Vestas has already warned that it will lay off 1,600 workers at its Colorado factories if the tax credit is not renewed. Japan-based Mitsubishi Heavy Industries has scrapped plans for a $100 million plant in Arkansas. The American Wind Energy Association said up to 37,000 jobs would be lost without the tax credit. Siemens said it is too early to say how much sales will fall with the loss of the credit or what the impact will be on the Hutchinson plant. Congressional action looks pretty unlikely at this point. U.S. Sen. Jerry Moran, R-Kan., introduced an amendment two weeks ago to the Senate’s transportation funding bill to extend the wind tax credit by one year, but it was never voted on. Another amendment that includes a wind production tax credit failed last week after it didn’t get the required 60 votes. Moran said he favors a law that would phase out a subsidy over four or five years to give the industry the time it needs to become cost competitive. After that, he said, they’re on their own. But doing it this way, just dropping them off a cliff on Jan. 1, 2013, makes no sense when the state has so much to gain, he said. “There is no state in the country that had more at stake in this than Kansas,” Moran said. It’s still possible that a wind subsidy might work its way out of the Senate yet this year, but the U.S. House of Representatives is another matter. The House includes a large contingent of staunch conservative budget hawks and opponents of alternative energy subsidies, including U.S. Rep. Mike Pompeo, R-Kan. He said the House is highly unlikely to pass any bill with alternative energy subsidies. But, he said, if the Senate were to pass something this year, it would go to conference committee to be reconciled with the House version. When that happens, he said, there’s no telling whether a tax credit would get through. Pompeo said he objects to the tax credit, as he does with all government incentives for any kind of energy. Having government rather than the market pick winners winds up costing taxpayers money, he said. He introduced a bill in the House to strip all energy tax credits out of the federal tax code, including those for oil and gas production, but it was defeated last week. “It’s a good first step,” he said of his bill. Regardless of what happens to the wind energy industry, Westar and other major Kansas utilities have a legislative mandate to produce or buy 20 percent of their electricity from renewable sources by 2020. Westar Vice President Kelly Harrison said the utility will be up to 13 percent — if the turbines are working at 100 percent capacity — when two new wind farms under construction come on line. Getting into wind power has been expensive. The prospect of new wind farms in western Kansas was one of the reasons behind the decision to build twin 345-kilovolt power lines from the Wichita area to Spearville, Kan., for an estimated $456 million. The bigger reason is to clear up long-time bottlenecks. Harrison said the new power lines are needed even if there are no more wind farms in western Kansas. And adding wind power to Westar’s mix was important. It already has coal, nuclear and natural gas power. “History has shown that because of our predecessors at Westar mixing sources, we have some of the lowest rates in the nation,” he said. Twenty-nine states have some kind of legislative mandate for utilities to buy a percentage of renewable energy. If that continues to stand in the coming years, it guarantees a growing demand for a set amount of wind-generated electricity. That means that, at some point, the price of wind power could become competitive again.